According to the agreement, Govecs will have a license to use BMW’s pending patent safety technology for two-wheelers. 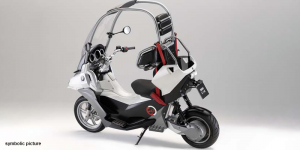 Based on these IP rights, Govecs plans to develop and produce an new electric scooter of category L1e and L3e. The safety feature may allow this scooter to be exempt from mandatory helmet use. In fact, computer simulations done for BMW consider their protective construction safer than a helmet. Their special construction is designed for increased collision protection but also to reduce the danger of injury by accidents. If Govecs manages to get their electric scooter approved without mandatory helmet use, they will open up a new product segment with huge potential for sharing and other applications. Thomas Grübel, CEO of Govecs considers going global when saying, “we plan to roll out this product across the globe, namely both in pioneering sharing concepts for metropolises as well as in the consumer segment”. Govecs aims to launch the new electric scooter by 2021 and say it will be positioned in the premium scooter market This includes pricing. Govecs base their standing on “Made in Europe” products for sharing platforms and on custom-made designs. In the most recent news, Govecs had announced a new partnership with a company in London for example. They plan to offer up to 6,000 rental electric scooters in the British capital. Overall, Govecs are also selling electric scooters and accessories to private customers since they launched their HappyScooter e-commerce platform. The product range currently includes electric scooters of brands such as Schwalbe or ELMOTO among others. Moreover, Govecs released the result of the first three quarters of this year. They generated sales of around 19.2 million euros from January to September 2018, an increase of over 50 percent compared to the previous year. Around 3,100 Govecs electric scooters were delivered to customers in the same period – compared to around 2,750 electric scooters delivered throughout 2017.